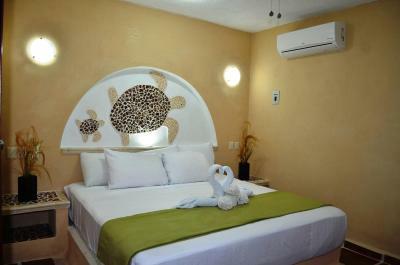 Good location, very near public market and Maya Museum and old ADO bus station. Easy walk to the water. The check in was hard, mostly because of language barrier but felt unwanted while checking in.The pictures on website were deceiving. Very poor lighting in bathroom. The beds were comfortable. Hotels in good location, it was easy getting to the ADO bus as one is just down the block. The other one to go to Cancun is a easy van ride. If you don’t mind a little bit older hotel this is ok for the price. The ladies in the restaurant were very friendly and the food was delicious. The blanket, it was extra soft that made my sleep even better. It said free breakfast but I had to pay for my breakfast. Very comfortable and very inexpensive. Good location. I would suggest fresh bread rolls instead of trying to toast them! We got excellent, super-friendly service and a great welcome by this family run hotel. La ubicación del hotel: está a un costado de las oficinas del ADO y del transporte a Calderitas y Bacalar, a un unos pasos del mercado municipal y del museo de la cultura Maya. Además de que la comida del restaurante del hotel es muy buena y a un buen precio. Hotel Real Azteca This rating is a reflection of how the property compares to the industry standard when it comes to price, facilities and services available. It's based on a self-evaluation by the property. Use this rating to help choose your stay! Hotel Real Azteca is centrally located in Chetumal, next to the city’s Mayan Culture Museum and 650 feet from the city market. The hotel offers 24-hour reception, free Wi-Fi and free parking. All rooms have air conditioning and a fan. They feature tiled floors, and each comes with a TV and private bathroom with a shower. The hotel has a restaurant and a tour desk. Chetumal Ferry Terminal is 0.9 mi away and you can drive to the International Airport in 10 minutes. When would you like to stay at Hotel Real Azteca? House Rules Hotel Real Azteca takes special requests – add in the next step! Please inform Hotel Real Azteca of your expected arrival time in advance. You can use the Special Requests box when booking, or contact the property directly using the contact details in your confirmation. One of the two double beds had very soiled sheets. It was really filthy and dirty and it stunk the entire room until the entire bedding was removed and replaced with clean service. The closeness to downtown shopping is awesome. The peacefulness and the promp attention. Front desk should have someone who can speak English. The wait for Breakfast was too long. The photos showed very nice room decor. Appearance is part of the criteria for chosing a place to stay. We were shocked as it did not look like the photos.One of the towels was frayed at the edge. This was misleading. I felt that it was misleading. Online, the price for the room included breakfast. They did not specify that breakfast only included plain black coffee and bread. Sugar and creamer were going to be billed separately. The parking lot was a little tricky to maneuver since it was narrow and there were alot of cars parked one way. Good parallel parking is a must if you plan to bring your car. Wifi in our room was working for 3 hours, then was not working at all for the remainder of our stay. Pretty noisy, millions of ants in the sink. The check in wasn’t my best experience. The lighting in the bathroom was very poor. The restaurant didn’t open for coffee until 7:30. Hard for a coffee drinker.